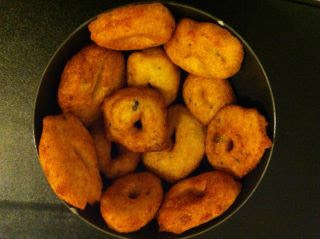 Uddina Vada is a traditional South Indian recipe which is a common MUST HAVE for any south indian breakfast. The idly and Sambar make a heavenly combination with the crispy vadas! Soak the urad dal in 2 cups of water for about 3 hrs. Grind the black pepper and keep it aside. Chop the ginger into very small pieces and keep it aside. Drain the water from the soaked urad dal.Grind the soaked urad dal with little water, so that the consistency is thick. Heat oil, pat the batter on a oiled plastic sheet and make a hole like donut. Slip this into hot oil and fry it till it is golden brown. Remove from the pan,remove excess oil by patting it on a tissue paper. Tip: If there is trouble in shifting the batter from the sheet to the pan then rava can be added as it absorbs the extra moisture and also makes it crispier.